MK Christmas Special : Kathie Hill Music, LLC, Making music with and for kids for over 25 years! 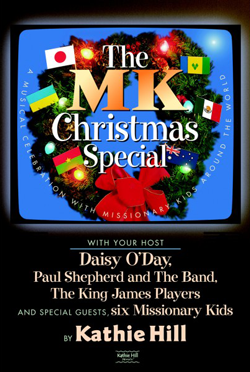 It's Christmas All Over the World as talk show host Daisy O'Day presents The MK Christmas Special. Accompanied by Paul Shepherd and The Band, Daisy celebrates The Gift of Christmas—Emanuel. Then, in interviews with six missionary kids, we learn that in West Africa, Jesus is called the Lion of Judah, in Ukraine, He is The Open Door, and in Australia the Good Shepherd makes Christmas a very G'Day! As each MK tells about their country and its Christmas customs, we learn Christ is The Living Water in the Caribbean, the King of Kings in Japan, and in Mexico, he is Jesu Christo— The Bread of Life. Daisy ends the show reminding us that Jesus is the Prince of Peace for a troubled world in Silent Night with Dona Nobis Pacem and challenges us to Tell the Story of Jesus' love every day. By the end of the Finale, the Christmas story, the names of Christ, and the importance of missions have new meaning to everyone who is a part of The MK Christmas Special! Kathie's Note: The amount of missions info in the DAV and the video clips to be used in performance are astounding. You can tailor this work to feature your own missionaries or do the songs in concert setting –turning this theatrical musical into a very simple production. I love “Lion of Judah”, “The Open Door” ,“Jesu Christo” and choirs should sing “Silent Night with Dona Nobis Pacem” EVERY Christmas! Choral book stock fluctuates - contact us before placing time-sensitive orders. Licensed Digital CD (3x) files with spilt left channel instrumentation/right channel choral vocals and stereo instrumentation only. (No dialogue or solos.). Review READ-ME.txt file contained in the zipped download for instructions about BIN/CUE use. Downloadable 3x licensed PDF of all songs, script, production notes & piano transcriptions (up to 149 pgs) with permission to make 3 copies . Additional copies require purchase of additional 3x license/s. Up to 200 downloadable pages of lesson plans, kick-off ideas, musical & spiritual activities and production & organizational helps for The MK Christmas Special. Choreography demonstrations for up to 7 songs in The MK Christmas Special musical plus staging, costuming and prop instructions. Also includes all six missionary videos in two formats - with underscore & recorded narrations and with underscore only for you to add your own narrators. A MP3 audio download of stereo recording of 12 songs w/license to make 3 copies - Additional copies require purchase of additional 3x license/s.